Sheffield based beer and food blog also covering an array of fine spirits. Passionate about high-quality, local produce. Occasional cat thrown in. 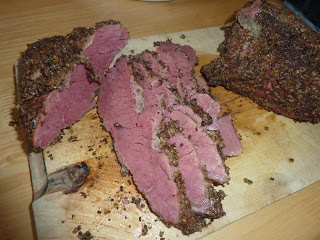 I have written previously about salt beef and brisket... it is one of my favourite pieces of meat as it becomes tender and delicious when cooked slowly and the fats in the meat dissolve deliciously and keep the meat juicy and tender. This time I am using a full brisket, weighing about 2.5kgs, and two slightly different brines, one for the salt beef and one for the slightly sweeter pastrami. Boil the brine ingredients with 1.5 litres of water, dissolving the salt, then leave to cool. Split the meat into 2 pieces - use a thinner piece, about 1/3 of meat, for the pastrami. Undo the trussing on the smaller piece and open it out. Pierce both pieces of meat all over to allow the flavours and salt to permeate, and place each piece of meat into a plastic or ceramic bowl (don't use aluminium as it can react with the meat). Split the brine over the meat, adding the honey to the pastrami brine. Make sure that you cover the meat completely in liquid - if you are short, top up with a little more boiled water. Once this is done, weigh down the meat with a plate to ensure it remains completely submerged in the brine. Cover the bowls in cling film and place in a constantly cool place, whether it be a garage or cellar, or a freakishly large or empty fridge. Turn the meat daily so as to get the best coverage of flavours through the meat. Leave for between 5-7 days then remove from the brine and rinse if needed - test the saltiness of the meat by lightly frying the a small sliver of meat. Depending on the taste you may need to rinse more than once. Add a couple of handfuls of smoking chips to the bottom of a roasting tin. Place the meat on the grill tray and put into the tin. Start with a blow torch (if you have one) on the chips, or on the hob to get the smoke going, then cover with tin foil leaving plenty of space for smoke to cover the meat. This process can either be done completely on the hob if you have a good extractor or in the oven at about 170°c for around 90 minutes. The next step is to steam the meat, using the same pan as before. Clean the chips out from the previous step and add a layer of water to the bottom of the pan, again covering with tin foil. Place on a gentle heat for 90 minutes, checking that the pan doesn't burn dry. Serve hot on sandwiches with pickles or sauerkraut. Whilst salt beef does need a bit of patience, it is definitely worth all the effort put in, as the meat at the end is tender and moist and a real show stopper for any occasion. Visit Smokedust for Prague Powder and Smoke chips as well as other paraphernalia. Let us know what you think! You can also contact us with any enquiries at jimrangeley@gmail.com - we'd love to hear from you.